Are We Oversharing About Our Kids To Make Ourselves Feel Better? Is parental oversharing on social media a cry for empathy, and for connection with other parents? What is it about kids’ crying and misbehavior that provoke such a reaction in us? It’s visceral. 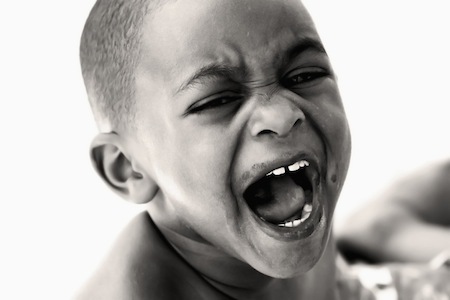 Whether your child is 2 weeks old or 2 years old, a child’s screams and weird behavior can rip at your inner soul as a parent. Unfortunately, I have a lot of experience in this area. My son had a horrific bout of colic that lasted for several months. He cried. And raged and wailed and screamed, day and night. We bounced him, we rocked him, we swaddled him, and we sang to him. Most of our efforts had little effect. And now my son is about to turn 2, and I feel like he’s constantly screaming again. This time, however, he makes his reasons known: He cries for 20 minutes because we put him in the stroller when he wanted to run into the street. He cries because he wants his socks on, and then he cries because he wants them off. He has a temper tantrum because the garbage truck left our street. Colic is mysterious; no one knows exactly why some new babies cry inconsolably for long stretches and some don’t. I think we have a good deal more knowledge about why toddlers cry. Melinda Wenner Moyer wrote a terrific piece in February in Slate about why toddlers have meltdowns. According to Moyer’s research, there are a whole list of factors that contribute to toddlers’ predisposition to crying tantrums: their lack of language skills, their inability to label emotions, their underdeveloped working memory and self-control, their inability to understand cause-and-effect, their lack of patience, and their failure to grasp timing. I posted it on my Facebook page, and a few readers took offense with the whole project, arguing that it was mean-spirited to document and then share to the entire world your child’s saddest and most pitiful moments. And when I read about the project on the Huffington Post, I saw there were hundreds of parents who agreed with my readers and felt that this dad was exploiting his child and the emotionally vulnerable and tumultuous developmental period of toddlerhood. If toddlers’ minds are a chaotic stew of new skills, new fears, new expectations, and new restraints, and there are scientific explanations for why your toddler is constantly freaking out, does all of this mean that we parents who find regular humor in our child’s emotional struggles are cruel? Should all of us just put away our cameras or our keyboards and just sit and empathize with our screaming bundles of rage? Is it wrong to share your frustrations as a parent with social media, posting your child’s most exasperating moments for the whole world? And then there’s Blair Koenig from the blog STFU, Parents. (It stands for Shut The F*** Up, Parents. Yeah, she’s not subtle.) The blog is intended as a forum for mocking parents for oversharing about their kids. Childless herself, Koenig describes her site as a “guide” for parents about what they shouldn’t post about their kids. She’s also releasing a book based on her observations and criticisms of parental oversharing. As a childless woman in her 30s too until two years ago, I understand her frustrations and judgment of parents. I get her outrage. I too felt bored, annoyed, and frequently disgusted by all of my friends’ videos and pictures of sonograms, potty training adventures, tantrums, and birth experiences. But then I had a kid. And I realized that the intended audience of what she describes as “oversharing” is not really everyone. It’s a cry for empathy, for connection with other parents in a world where parents often feel alone, overworked, isolated, and disconnected from families and friends in real life. The hardest thing about being a parent is that my child’s behavior is so exhausting and perplexing that I feel like I may be raising the only child in history who has been this difficult. Certainly not true, but I’m constantly saying to myself, “This can’t be normal. Really, it can’t.” After a 10-minute screaming fit in the middle of a crowded sidewalk because a store was unexpectedly closed. After he uses chairs to climb onto the dining room table and attempt to swing on the chandelier and then has a fit when I won’t let him repeat that feat. For a parent and the child, it’s tiring in every imaginable way. For me, it truly helps to have a sense of humor about these constant meltdowns or crazy behavior. It helps to have someone to laugh with and to know someone understands. I don’t think this is exploitative of the child, even if you choose to share your child’s tantrums with the world. According to the Tumblr creator, Pembroke, he and his family—after their morning show appearances and media celebrity—have become overwhelmed by unsolicited advice from other parents about how to get his son to stop crying. However, he says that his son, like mine, just has fleeting, intense tantrums and is generally a pretty happy kid. That doesn’t surprise me, and I’m grateful to him and his dad for helping us parents of toddlers not feel so alone. Of course, there are lines that we shouldn’t cross as parents—and certainly some parents cross it—I don’t think these posts go over the line. As for Koenig and her demands that parents should STFU? She should get back to me if she becomes a sleep-deprived parent who has no idea how to handle her kid’s current crisis and she stumbles upon a blog that makes her laugh and nod in commiseration.